The author of the much acclaimed #1 Indie Next Pick The Green Age of Asher Witherow returns with an enthralling new novel eleven years in the making. Epic in scope and yet intimate in its emotional power, Perpetua's Kin is a multi-generational mystery, a reworking of Hamlet, and a profoundly contemporary exploration of the American experience as one family embodies it: our violent heritage, our vulnerability to the vastness of our own geography, our chronic restlessness and desire for regeneration through technology, and the impossibility of escaping the history that forms us and, always, demands a reckoning. In the nonlinear, fragmentary manner of memory and inherited stories, the novel moves across much of North America over more than a century, from Pennsylvania and Iowa in the 1820s, through an American south embroiled in civil war, to the remote west of the 1880s, and finally to World War II San Francisco. What emerges is a portrait of a family shaped as much by tumultuous world events as by its members' long-kept secrets. he is one of the bravest and most talented novelists writing today. along with its dark mystery and heartbreaking tension. "Perpetua's Kin blew me away with its stark, astonishing music. language so uncannily beautiful, so powerfully strange. This is a flat-out brilliant book." 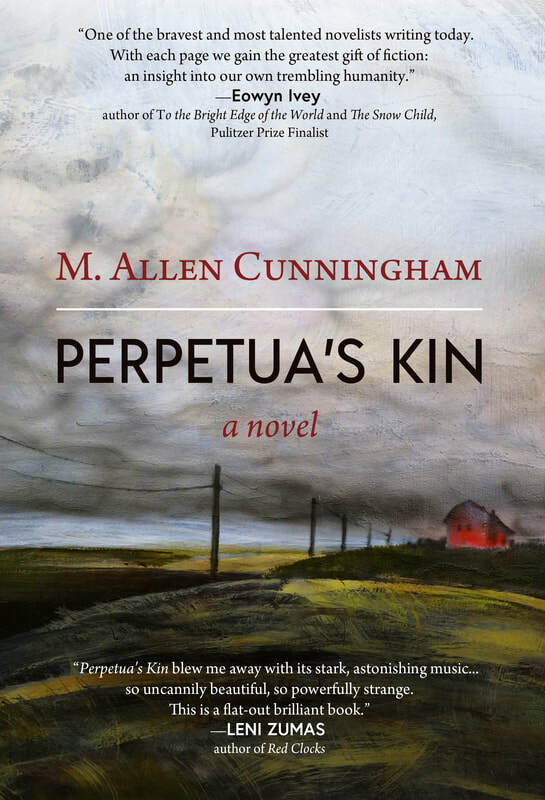 "Cunningham writes a gorgeous story of a tangled family history that spans five generations. these secrets come to light and have a devastating effect upon the unaware descendants. and his precise wrangling of the English language shines throughout this book. and a story that won't unclasp its grip on you." the continent, through multiple eras, and into the souls of his characters. ​the vast American landscape that breeds both." but essential to our understanding of the complicated present. confronting brutal truths and embracing hard-won compassion." and restlessness, through the lenses of war and telegraphy." are tangled knots and whose stories are intricately woven through time and place. ushers us on a brilliant magic carpet ride steered by a master storyteller." or a retrieved packet of hidden letters, this narrative's power is irresistible." substantial book, and a joy to read." "M. Allen Cunningham has once again raised the bar on the art of the novel. I enjoyed Perpetua's Kin as one would a rare smoky scotch — savoring the complexity. themes — war, love, wanderlust, suffering — are universal. novelists can have on every one of us." as possible...expansive in scope and ideas...precise and tight in language. constantly demanding our attention and let me sink into its enchanting world." in its own way.' By the same token, every family harbors its unique secrets. (as they almost always are, wittingly or unwittingly), affecting multiple generations. to understand each other's demons and motivations. Are we condemned to repeat the past? Or can we make peace with our legacy and move on with our lives? Much to contemplate in this thought-provoking novel." questioning and underscoring a number of basic American assumptions. Cunningham is pondering notions of family inheritance and family angst. do we unknowingly carry? Cunningham’s style [is] verbal pointillism. to 1940s San Francisco as it traces the fortunes -- and misfortunes -- of the Lorn family. A classic multigenerational family saga. A beautiful love letter to the written word. aspects of generally well-known time periods. A treat for anyone who enjoys elegant writing."